On the way to work today I decided to to go Starbucks. Which doesn't really mean much other than I go down this little road a bit farther. Today this car was coming the other direction and went too far over into the dirt and was flying towards me out of control. She was all over the road with her back end fish tailing. Somehow she had it straightened out at the point that we passed each other and just BARELY missed a telephone pole. I saw her face at the point that she passed me and she was laughing. How lucky for her that she didn't hit that pole. Or me. Or flip. It's moments like those that put your life into perspective a bit, don't you think? I got off work a bit early today. Wednesdays are early release days at my kid's school. It's also one of the days that band practices after school. Last year I didn't let Melissa go to band on Wednesdays since she wouldn't have a ride home unless I got off work early. Today I just got off early (one hour) so she could go. What's one hour in the big scheme of things? It makes her happy. I finished reading my book for this month's book club tonight. 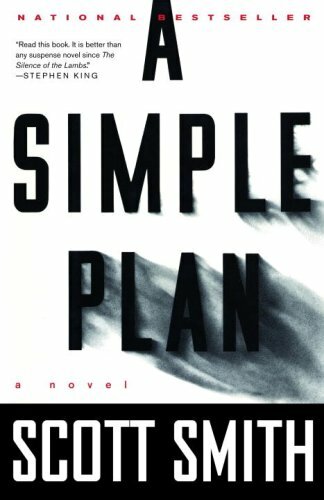 A Simple Plan by Scott B. Smith. This is a book that makes you just keep reading so you can find out what happens next. By the end I was in a bit of shock about all that went down but it's definitely a book you don't want to put down once you start reading it. After I got done with it this saying that I think my Grandma used to say popped into my head. I've always been in awe of people that can just lie and have secrets. I'm not one of those people. I can probably count on one hand all the lies I've told in my life. And I really hate it when people say "can you keep a secret?" because I really can't. Every night this week I've worked with Trevor on his spelling words. I start off by giving him a practice test and then whatever words he gets wrong I make him write them a few times. Tonight he got all but one (braid) right. Woohoo!! He wrote that 10 times so I bet he can get it right tomorrow. He wanted to sign up for the Pokemon website today. I swear I had to go through more steps and questions to get him an account there than I had to to open a bank account. It probably took me a good half an hour or longer. Why do they make things so difficult? You make a great point about what's an extra hour. I have been trying to reprioritize and finding that really out of the week I can sacrifice an hour or two for the things that are most important! I hear ya! ooh thanks for the book suggestion, I need a new one. Right now I'm reading Jennifer Weiner's Then Came You. I just picked it off the 'new' shelf at the library and it is VERY good!! I have mistakenly ruined more than one surprise party in my day through my tendency to let slip a secret. And yesterday I was impersonating my daughter on the phone in order to get back into her online medical account (over 13 and the parent technically cannot get into the account to see lab results or anything else, really - how stupid is that?) and I kept panicking that I would blow my cover while the woman on the other end was asking me the security questions that I myself had set up. I was thinking, "What a tangled web..."
My mom used that saying all the time since my sister was a compulsive liar. I'm glad that car missed you!